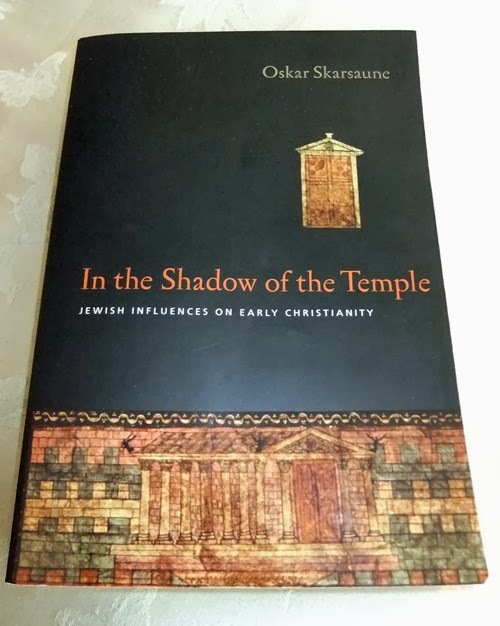 Review of "In The Shadow of the Temple"
I've already relied much on what I've learned from "In the Shadow of the Temple: Jewish Influences on Early Christianity" by Oskar Skarsaune that I thought I should review it so you can get a sense of the scholarship involved as well as maybe be intrigued enough to read beyond my noodlings here. I have only read a few books on Judaism (this is how new this is to me). This is my fifth book and the second on Judaism and Early Christianity. Insert the usual refrain about how I'm not an expert at this. However, I know good scholarship when I read it. When the author is not afraid to admit that he's about to put forward a theory that has been disagreed with, or is based on historical points not quite agreed upon by fellow scholars, and happily shares references of scholars who agree *and* disagree with him, this is about as balanced a piece of scholarship as one can possibly get. Skarsaune starts with the Maccabees and goes through the geopolitics, the importance of Jerusalem and the various flavors of Judaism before reaching Chapter 6 "Jesus within Judaism". The entire text is fascinating. I usually enjoy an author with a bit of snark, but Skarsaune writes so thoroughly on the subject that I found it a book difficult to put down. At the end of each chapter, Skarsaune summarizes his findings, and provides an extensive list of further reading that I fully intend to take advantage of. I'm not one to mark the page of a book. About as far as I can go is to bend over the page corner so I can find the page and then hopefully figure out what made me mark the page. But I am seriously considering giving this a second read and making free use of (*gasp*) a highlighter. I think the only place the scholarship got a little too theoretical was when he looked at Christology and how Jesus' divinity came out of scriptures (as well as whether or not Jesus and/or the disciples had a clue about this divinity). He decides yes, but doesn't make a compelling argument for me (honestly, I am a Christian!). This may be simply because this is a hole in his speciality or the evidence of the time (not later Christian theology) isn't sufficient, or I just didn't get it. But he gives me further reading. I highly recommend this book for anyone interested in the Jewish roots of Christianity.